Would Proposed Parking Garage Ease Midtown Parking Woes? 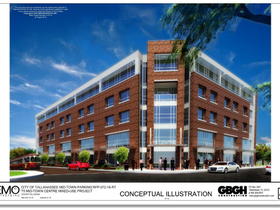 City officials are gauging public reaction to a proposed parking garage in Midtown Tallahassee. Most stakeholders agree there is a parking problem – but there are disagreements on its solution. Sally Bradshaw is founder and owner of the Midtown Reader bookstore nestled in the heart of the district. “That parking garage would be at Fifth Avenue and Thomasville Road, and my understanding is that it would be fronted on the two sides that would be visible to those streets by retail and potentially residential,” Bradshaw said. The City has received two proposals from developers on its construction, and Bradshaw says as a business owner she is in support of the garage. She thinks it could alleviate Midtown’s parking woes. Bradshaw says her business has felt some of the effects that come with those challenges. “There are people who come all the time to our bookstore and say I wanted to come last week, but I couldn’t find a parking space,” the bookstore owner said. Mike Brezin, co-chair of the Alliance of the Tallahassee Neighborhoods, wants the City to hold off. WCTV reports the garage is projected to cost about $12 million dollars. Compared to Bradshaw, Brezin feels the City would be better suited considering other solutions. “What we’re really looking for is a more incremental approach to solving the problem, the parking problem so-called, in that we feel there are many alternatives along the way,” Brezin said. Some potential options Brezin mentioned are a parking app, or what’s called a “hold-harmless agreement” that would allow businesses to open up nighttime parking without liability.